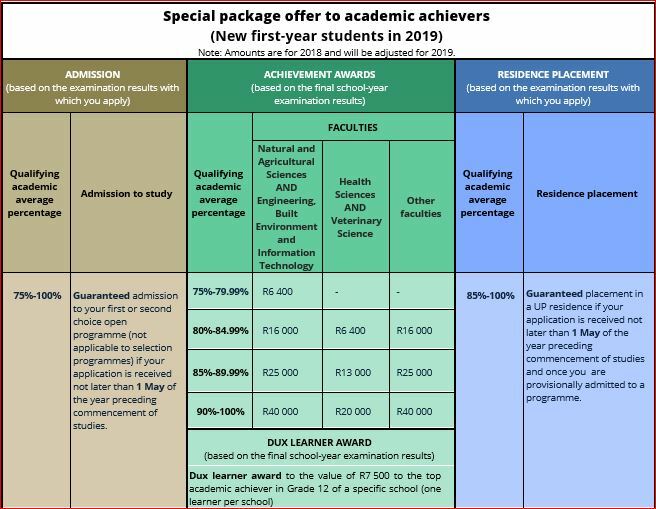 The special package offer to academic achievers is based on the average percentage obtained in a school examination (refer to the table below). This special offer includes guaranteed awards, placement in programmes and/or residence placement. Please note that the academic average percentage is based on a calculation formula of the University of Pretoria. (Award values are for 2018 and will be adjusted for 2019). The University reserves the right to amend the regulations and conditions applicable to bursaries, awards and loans without prior warning. Please visit www.up.ac.za/feesfunding for the latest information. For further enquiries, please call +27 (0)12 420 3111 or email [email protected]. If you require study advice from a student advisor, please contact Ms Carol Bosch at +27 (0)12 420 5144 or [email protected]. Terms and conditions apply – please visit www.up.ac.za/feesfunding for information.